I had misplaced something this weekend. It was anything too important but just the fact that I couldn't find it was driving me crazy! After I'd looked in all the use suspect places, it was time to dig deeper. I ended up pulling out my old purses to look through. I didn't find what I was looking for, but I did discover something in passing -- actually two things --- a stack of old notebooks and a life lesson. I am a writer -- of stories, of books and of to-do lists. Every single notebook was filled to varying degrees with lists – grocery lists, budgeting plans, recipes, chore lists, vacation packing lists, gardening plans -- you name it, it had a list. The sad story is, however, that most of those lists didn't see the light of day. Budgets went askew, impulse buying probably replaced most of the grocery lists, my garden planning is more or less a fly by the seat of my pants exercise in futility, and on every vacation I've ever been on, I forgotten to pack more than a few essential items. As I thought about all those unfulfilled lists in those multitude of notebooks, it reminded me of a lesson I often try and teach to the others --- dreams are only the first step to anything, action is required to make them come true. Now, not all lists need to be actualized, but they are meant to be works in progress. They are mean to be tweaked, and most importantly -- they are meant to be used. My challenge to myself is to go through my notebooks and pull out those dreams that still live deep inside of and work through them. There are story and book ideas, craft ideas, recipes waiting to be made and ideas waiting to see the light of day. I challenge each one of you who is a chronic list maker who never gets anything done, to work on yours too. 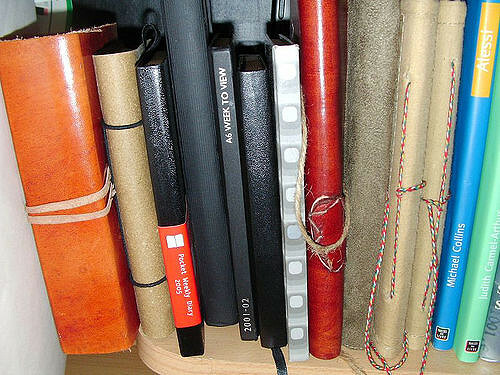 Get a set of notebooks -- one for writing down recipes, Tick them off as you make them. Another for grocery lists -- take this one to the store with you when you shop. Make your lists work for you as you make your ideas and dreams come to fruition. Time is your enemy and your friend.